…with the Lacy Baktus pattern. 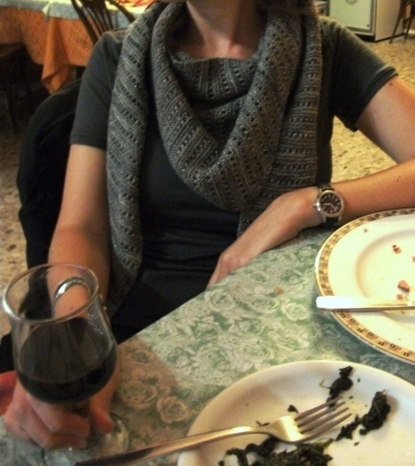 A few years ago I came across this pattern by Terhi Montonen who made it as a variation of Baktus Scarf by Strikkelise on Ravelry. For a while (longer than I’d like to admit) I thought this pattern was called batkus and in my often 12-year-old-boy brain, I thought of it as buttkiss, so buttkiss it will always be to me. I knit my own hybrids of a basic watch cap, plain socks, and one particular Stephen West hat pattern over and over again for gifts and hard-wearing work-a-day items, but the Lacy Baktus is the only pattern I really feel like I could knit ad infinitum as is without modification beyond size. 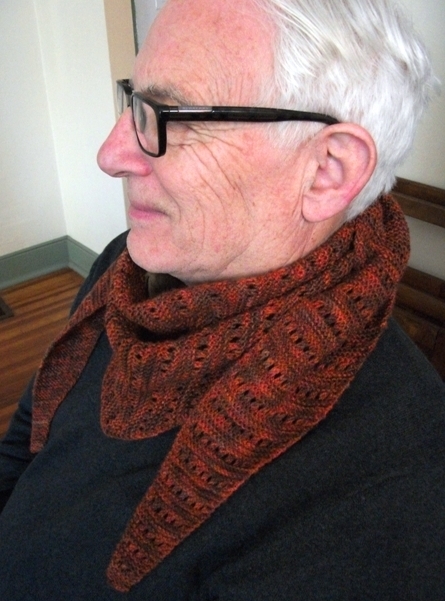 I made the first one a few years ago with two skeins of the tongue-twisting Koigu Painter’s Palette Premium Merino yarn (or KPPPM) that I picked up from School Products on a scorching hot summer day in NYC. I didn’t quite capture the colors correctly in the in-progress pic, but the second image is accurate. That one also shows our former awesomely textured and colored garage wall… sigh. 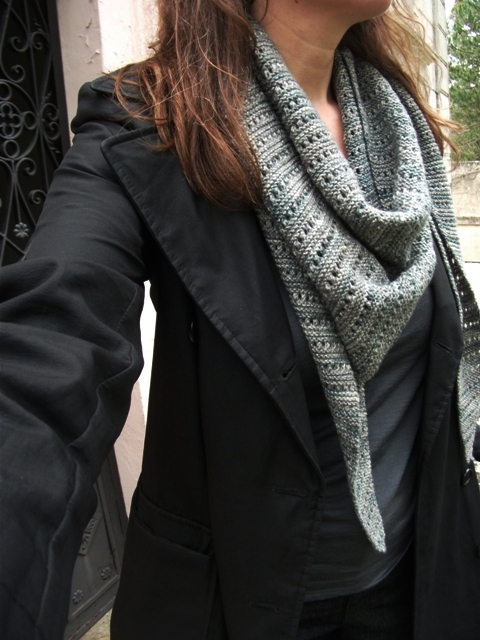 But I really liked the finished scarf/shawlette hybrid. 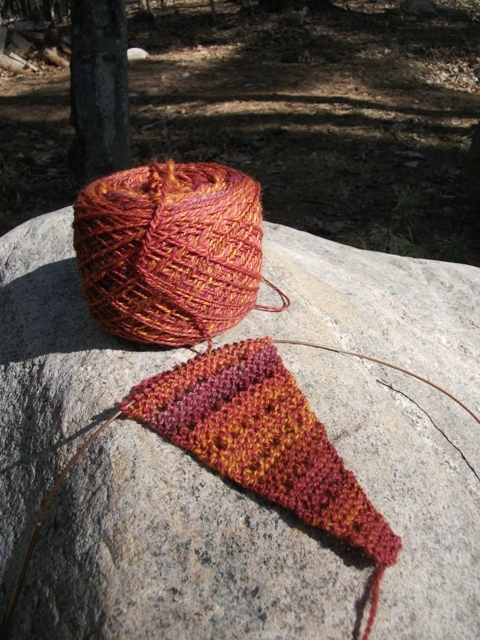 I loved that it stretched lengthwise but it was a long tapered triangle. 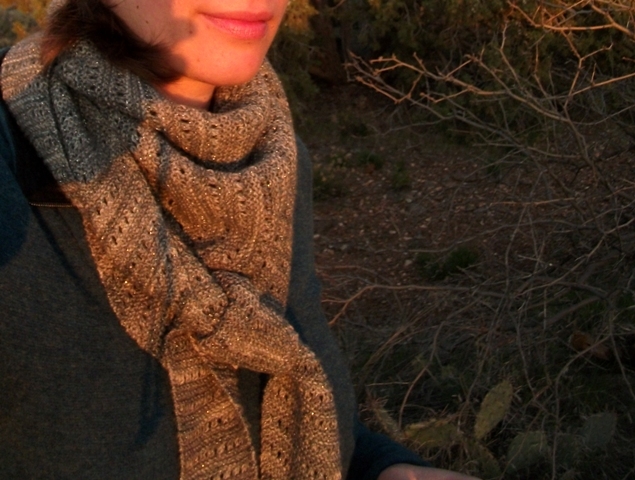 The only minor fault I have with this one is that it is at times slightly too short – we’re talking only an inch or two – when I tie for more warmth or protection against grabby wind the ends poke out rather than drape downwards, but no big deal. Maybe it was the same year, or the next, but I was caught without a gift for my mother’s birthday. I’d already picked out this Plymouth Happy Feet sock yarn for myself and had it patiently waiting in my stash, but I knew my mom liked orange and at the time had a pair of eyeglasses with purple and orange streaks in them, so it was a good match. 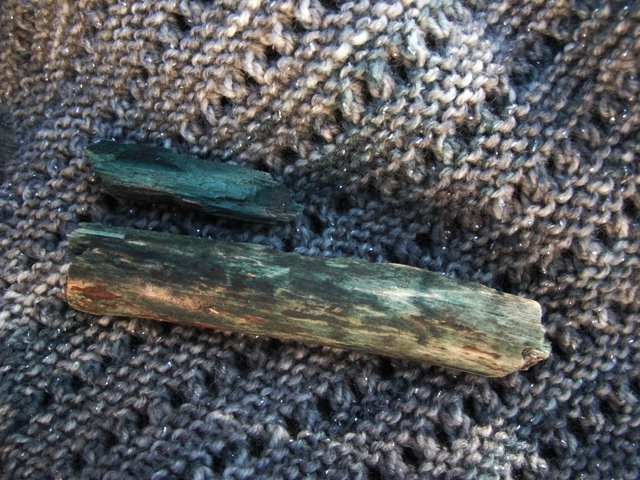 N and I were in a long-distance purgatory at the time too so I had a lot of time to knit in airports and trains. I found this to be perhaps the most perfect travel project since it required no complex thought and was extremely gratifying to watch grow and then shrink, and could be interrupted and shoved back in my bag with little worry. I even used some ghastly but surprisingly comfortable TSA-friendly plastic needles whose origins are completely unknown to me – I think they came from a box of miscellaneous sewing supplies from a garage sale. 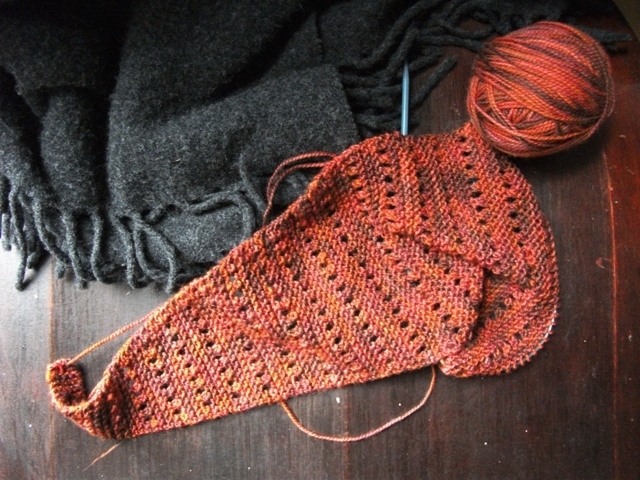 The Happy Feet had a bit more yardage, so the finished scarf was the perfect length even before blocking. Mom wouldn’t model it for me, but Dad is a good sport. 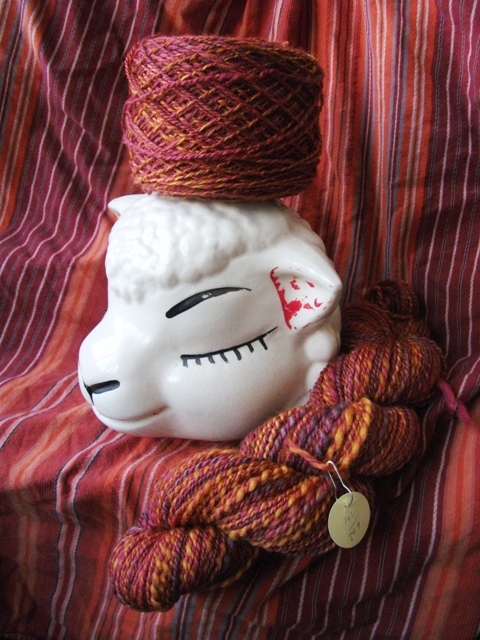 I’m tempted to re-buy this yarn to do a re-run for myself, but I have plenty of other pretty things languishing in my stash, not to mention I think this color is discontinued. So I worked on this most of last Spring and early Summer when I was not coping very well with the slashing and burning of my job and subsequent relocation and it was rather soothing activity. 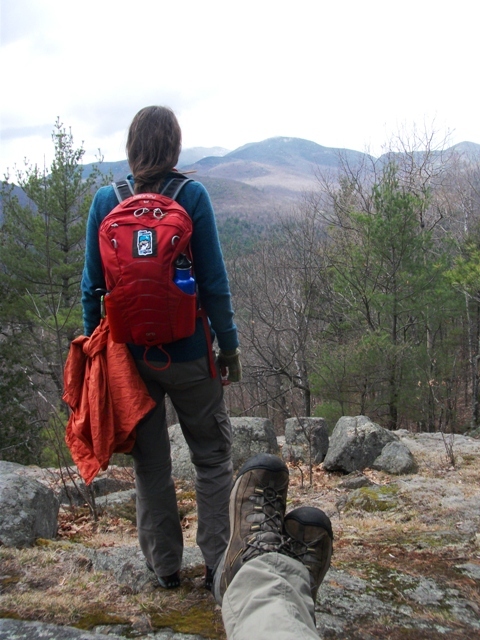 A large section of it was done when while we were resting from hikes in the Adirondacks. 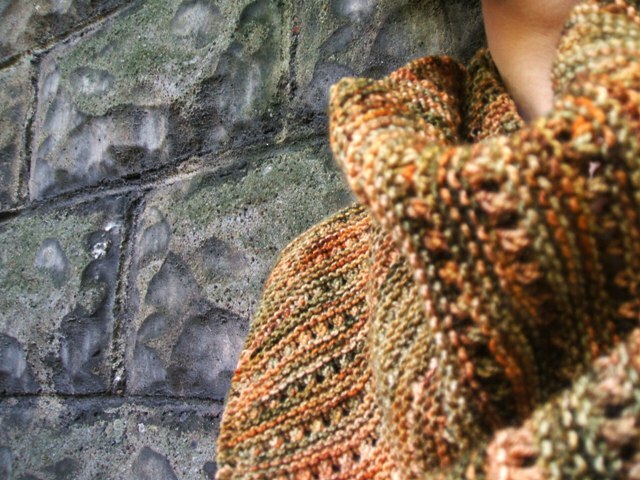 Then it was done before I was ready to finish it and I had to wait for the weather to cool down into autumn to wear it. But wear it I did, and continue to do. It’s also been traveling quite a bit. And it does well to dress-up a t-shirt (even after it has spent a day on the trail), and I do in fact own several very similar grey wool t-shirts. I like grey and I like wool, nothing wrong with that, right? And at times it has also functioned properly and well as an honest-to-god good wooly warmth machine and left the cafes and city streets to go hiking with me. And you know what? I decided I wanted another, and then maybe another after that. 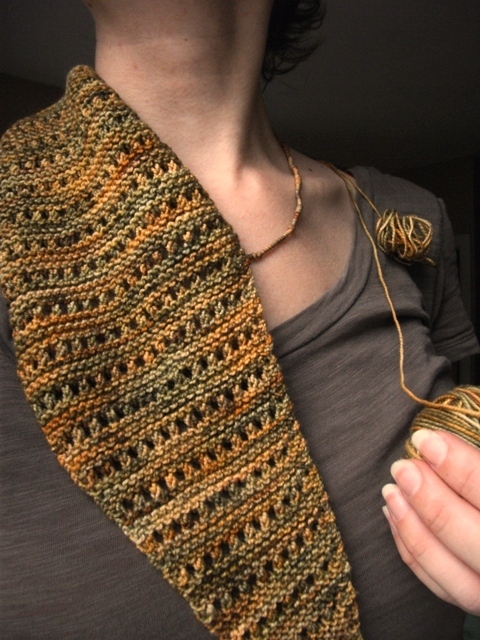 And I thought that since I love the pattern so much, I will make one with a yarn I don’t really love at the moment to see if my opinion of it will change. 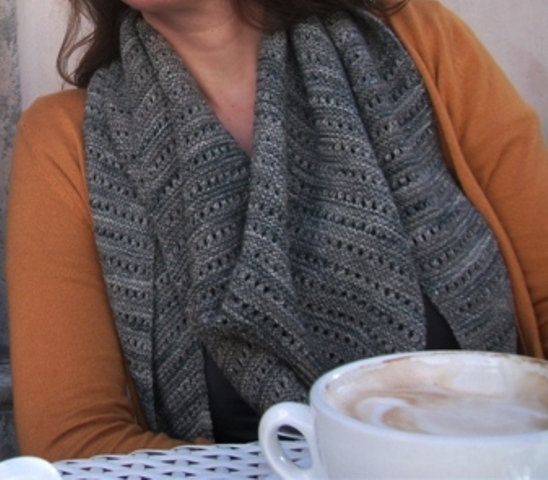 If it doesn’t, I will have another gift to give, if it does, I will have a new scarf in warmer colors. This one will be a little larger than the second (orange) one but not as gloriously large as the grey. Remember the much maligned Redwood Roving Mix? Yep, onward! 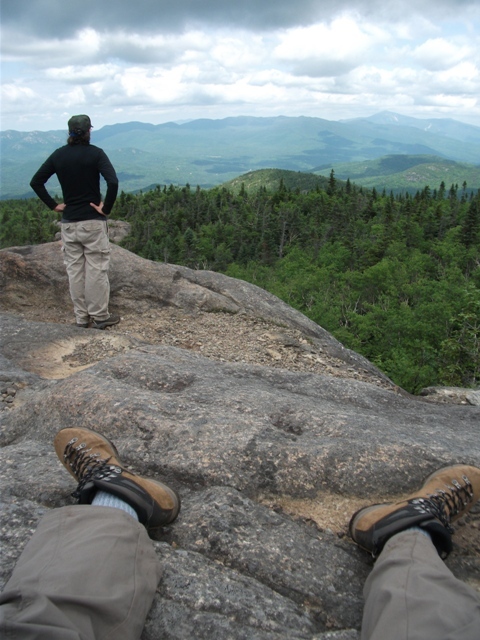 And a last-minute long weekend trip back to the Adirondacks last month was the perfect time to start it. *Yes, these two words, especially in combination, typically make me run for the hills… and I believe this yarn might be discontinued as well, but it can still be purchased from various shops and online purveyors. **Happens when the deer eats something in late winter – you can look up a pic of it yourself. ***I detest swimwear and all things beach bum, but the sea is somewhat sorta close by and we currently have no yard so I can pretend it is our outdoor living space at the moment.